The perfect guide to get you up and running with your new Canon dSLR camera The Canon EOS Rebel T3/1100D is a popular dSLR camera for those moving up from point-and-shoot for the first time. This full-color guide explains all the buttons, dials, and menus, helping you understand your camera and... read more start using all its features. Plenty of colorful photos from the author's portfolio illustrate what you can achieve. The book covers shooting in auto mode, using the onboard controls, working with Live View, and managing exposure, focus, color, and lighting. It also addresses specific shooting situations, how to get your images from the camera to the computer, and tips on editing and sharing your photos. 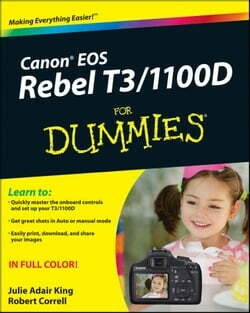 Canon's Rebel T3/1100D is a popular starter camera for those moving from point-and-shoot to SLR; this book helps dSLR newcomers understand and use all the controlsCovers using all the dials, menus, and modes; working with Live View and playback; dialing in exposure and managing lighting; and shooting in auto modeExplains how to get the best images in various situationsAddresses how to get images from the camera to the computer, editing techniques, and how to print photos or post them onlineFull-color photos from the author's collection show what you can achieve Anyone moving up to dSLR photography with the Canon T3/1100D will gain skill and confidence from this easy-to-follow guide.